A lot of major MMORPGs in our list including Elder Scrolls Online, FFXIV, and World of Warcraft suffers a heavy price decline during November and December. One main reason is that these games just had a major game update or event in the last few months causing the price to be very high. On the other hand, other games have been releasing a lot of in-game events in accordance to the winter festivals, including new costumes, PvP season, special items, and quests causing an increase in their in-game currencies prices. Blade and Soul Gold price had a 20% increase since the second half of November until the end of December. The increase started when Blade and Soul released a new patch update “Midnight Skypetal Plains” coming with new content, raids, items, PvP season, and changes. In additional, several in-game events were released along with the update including log-in event, costume sales, and challenges. Then, the game launched another update in an early December “Ruins of Khanda Vihar” bringing a new story questline, legendaries, and dungeon with winter festivities shortly after. All of these caused the rise in Blade and Soul Gold price. However, it should return to a normal rate again in January and stay stably for a while. The cheapest was on November 13, 2016, which is 100 Blade and Soul Gold for $8.20 and the most expensive were on December 11, 2016, for $10.48. It has a 24.88% increase. The release of patch 3.45 update, Soul Surrenders, caused FFXIV Gil price to still staying high since October. 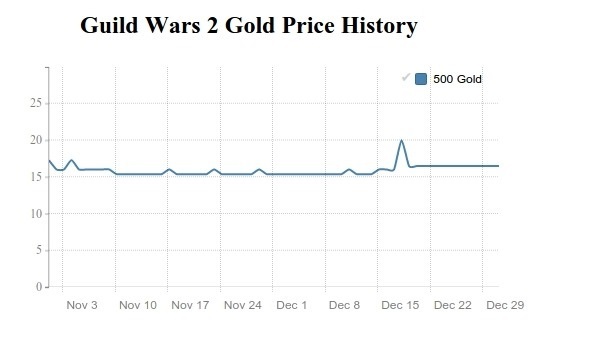 Then, it started to decline and had a sudden drop on December 14 returning the in-game currency price to its standard rate. After that, it had been remaining in this specific rate at $14.85 per 5mn Gil til the end of the month. Final Fantasy XIV news during these two months revolved around previewing the upcoming 4.0 expansion, Stormblood, planning to release in summer 2017. Until that time, there shouldn’t be much change in the Gil price. The cheapest was on December 14, 2016, which is 5mn FFXIV Gil for $14.00 and the most expensive was on November 01, 2016, for $19.35. There is a 38.21% drop in the Gil price. In November to December 2016, Fifa 17 coins price had been staying at the same rate most of the time at $11.97 USD per 50k Coins. It is around the same range after it can find the average price back in October, a month after game launch. There was a slight up and down on the in-game currency price in the mid of December but it quickly returned to a normal stage. However, the real decrease started at the end of the month and it should still last til January next year. The cheapest was on December 30, 2016, which is 50,000 Fifa 17 coins for $7.6 and the most expensive was on November 1, 2016, for $11.99. Even though having the high discrepancy rate at 57.76%, Fifa 17 Coins price is almost unchanging throughout the months. The impact of the latest Guild Wars 2 Update, Rising Flames, still existed in November to December. It seems like the update set a new standard Guild Wars 2 Gold price to ~$15 per 500 Gold, instead of $13. In addition to the last month update, NCSoft had been release several events in the game from costumes to a tournament of legends, new PvP season, to the Wintersday even bringing many activities to the game during this holiday season. It resulted in the increase of the in-game currency price once again especially on a one-day rapid 30% rise on December 18. 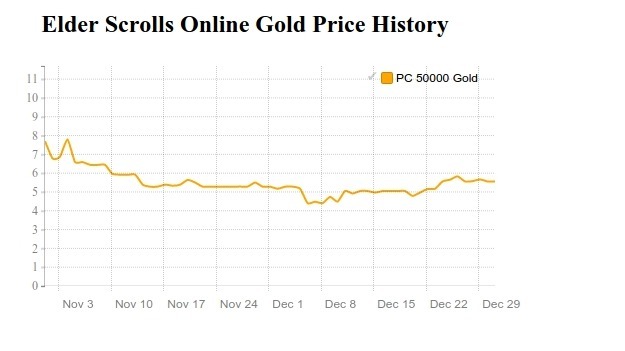 Guild Wars 2 Gold price should still be staying at this rate for a while and start to decrease in February next year. The cheapest was on November 12, 2016, which is 500 Guild Wars 2 Gold for $15.35 and the most expensive was on December 8, 2016, for $19.95. These is a high 29.97% fluctuation rate because of that one-day rise in price. The Star Wars Movie Rogue One does not have an impact on the RMT like the Force Awaken released last year at all. After the movie release date, SWTOR credits price still struggled at the range of $5.5 per 10mn Credits. Looking at Star Wars the Old Republic update, what’s more, surprised was that the newest update Knights of the Eternal Throne just launched a few days before the movie, but the in-game currency price didn’t change at all. SWTOR Credits price started to rise only around at the end of Dec after staying in the range of $5.5 during these two months. The cheapest was on December 4, 2016, which is 10mn SWTOR US Credits for $5.20 and the most expensive was on December 29, 2016, for $5.8. There was a slight 11.54% increase. The fluctuation of Tera Gold price had come to an end in December after the game did not add more costumes to the store. In addition, Tera gold price began to decrease once again in December causing the RMT price to be as low as $23.98 per 20k Tera Gold. It seems like the marketing strategy that had been working well for a past few months started not to work that well anymore. Unless Tera Online brings a new update to the game with additional quests and story, its in-game currency price should be declining continuously. 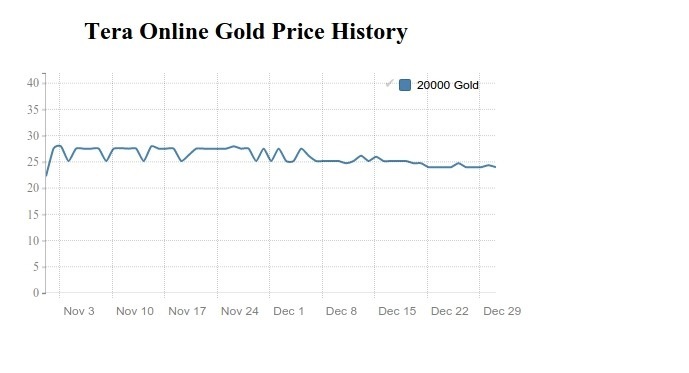 The cheapest was on December 31, 2016, which is 20,000 Tera Gold for $23.98 and the most expensive was on November 05, 2016, for $27.52. There is a 14.76% decrease.